Everyone knows that our world is rapidly changing today. But how should we react to these changes? Some people are celebrating the arrival of our digital future with horrifying naivety, expecting things to change like the weather does. But what has digitization brought us so far? "More consumption of fossil fuels," says Richard David Precht. How would a future – one that we would want – look in the digital age? Richard David Precht sketches out the possibilities, dreaming of energy savings, breakthrough inventions in medicine, and a new world of work. Digitization, migration, climate change – in the third millennium, our world is marked by revolutionary technical, climatic and demographic changes. As Precht says, on the one hand, digitization is successful in transporting information anywhere in the world, but in the process we are consuming considerably more energy and resources on the other hand. Magic word and "magic devices"
Around the world, the word "digitization" is on everyone's lips. To keep up with this development, we race to upgrade our communication and production technologies. But these "magic devices," as Precht calls them, consume much more (fossil fuel-generated) energy than they are helping us to save energy. According to Precht, the economic and governmental decision makers of the industrialized nations must come together and try to approach the challenges of migration, climate change and digitization holistically, instead of trying to solve them in isolation. 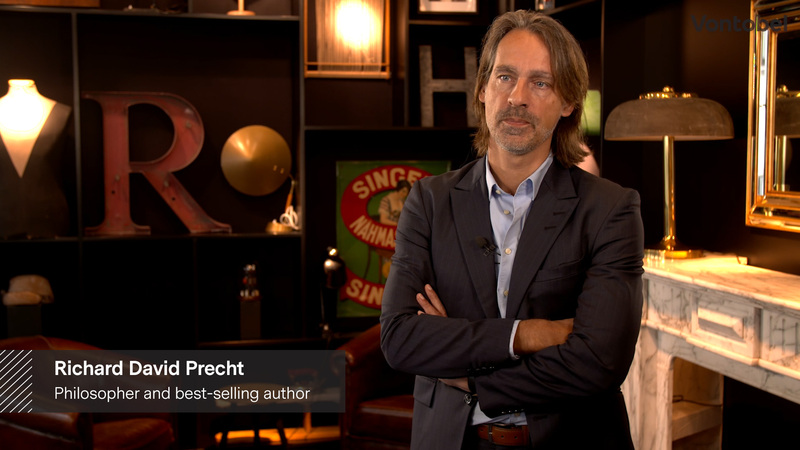 Learn in our video interview how Richard David Precht sees the world of tomorrow. Richard David Precht is a philosopher, journalist and author and one of the most distinguished intellectuals in the German-speaking world. He is an Honorary Professor of Philosophy at Leuphana University of Lüneburg and Honorary Professor of Philosophy and Esthetics at the Academy of Music Hanns Eisler in Berlin. Since the success of his book Who Am I And If So, How Many?, all of his books on philosophical or sociopolitical topics have been bestsellers and have been translated into more than forty languages. Who are we? How do we live today? And how will digitization change our lives? How the future will unfold is preoccupying society more than ever, with engineers, doctors, politicians – each one of us, in fact – seeking answers. This video interview with Richard David Precht is one of many contributions that shed light on the theme "Digitized Society" from a new, inspiring perspective. We are publishing them here as part of our series "Impact".